Author’s Note: This post is one in a series of posts that breaks down the 2010 Soccer MVP Tournament competition. Be sure to look at the final results to review how ‘Inside’ was crowned champion. The first discipline that the four main parts-of-the-feet were evaluated on was its structure. Specifically I looked at the flatness of the surface as well as the forgiveness level. The forgiveness level is how forgiving a surface is when the ball does not make contact with each surfaces’ respective sweet spots when trying to receive, pass, or shoot the ball. ‘Bottom’ was crowned the ‘Structure’ winner with ‘Inside’ coming in a close second (see table below). Imagine playing billiards with cushions (bumpers) that were not flat/straight. You would have little idea how the balls would ricochet off the cushions. However, since they are straight, you will always know how a ball will behave coming off a bumper (unless the ball has spin or English on it). The same principle carries over to soccer. The flatter the surface, the easier it is to control a soccer ball. A flat surface eliminates a lot of unpredictability in terms of how a ball will respond when it is received, passed, or shot. Despite the studs/cleats, the undercarriage of a shoe is flat across the entire length of the shoe (represented by the lime green line in image ‘A’). The flat surface of the inside-of-the-foot extends the full length of the foot’s arch, from the ball of the foot in front to the heel in back (represented by the blue lines in images ‘A’ and ‘B’). Note that this surface is slightly concave (it is more pronounced in image ‘A’). As it turns out, a concave structure has a significant advantage in controlling a soccer ball. Concave shapes have a way of drawing a ball in for better control. Some examples of concave shapes that are very effective are the position of a football receiver’s or soccer goalie’s hands when catching or receiving a ball. The shape of a baseball glove is also concave. In my Loopball curriculum, I like to refer to the inside-of-the-foot as a glove, especially with younger players. The top-of-the-foot is also relatively flat. While it appears to be slightly concave (represented by the purple line in image ‘C’), the top of the bare foot is relatively flat). ‘Inside’ and Laces’ tied for second because ‘Inside’ had a slightly longer surface area but ‘Laces’ was straighter. The opposite is true for ‘Outside’. Its shape is more convex (as shown by the yellow lines in images ‘A’ and ‘B’). This makes controlling a ball much more difficult. Everyone has heard of hand-eye coordination. A vast majority of sports as well as simple daily activities require and develop this coordination. Soccer, on the other hand, requires good eye-foot coordination. Since this is a skill that is extremely difficult to develop and there is not much opportunity to develop this skill other than on a soccer field, there is much value when a surface has a lot natural ‘forgiveness’ built into its structure. Each foot surface has a natural sweet spot. I measured forgiveness by the additional area around the sweet spot where ball control can still be achieved with some degree of success. In this discipline, ‘Bottom’ and ‘Inside’ tied for first. ‘Laces’ came in a respectable third and ‘Outside’ a distant fourth. The sweet spot for the bottom-of-the-foot is in the front-center portion of the foot (dark red spot in ‘image ‘A’). Its forgiveness area radiates out to the edges of the foot and down to the heel (red transparent area in image ‘A’). There is a protrusion of the talus (ankle) bone near the top of the arch (red spot in image ‘C’). That is the main sweet spot for the inside-of-the-foot (red transparent area in image ‘C’). The forgiveness area is not quite as large as the bottom area. However, ‘Inside’ has a secondary sweet in the front of the foot (smaller red spot in image ‘C’). This spot is namely used for passing or shooting the ball with a curve (like ‘Bend It Like Beckham’). By virtue of this second sweet spot, ‘Inside’ earned a tie for first place. ‘Laces’ has a great sweet spot (red spot in image ‘B’) but its area of forgiveness is smaller. The sweet spot for ‘Outside’ (red spot in image ‘D’ below) is in the front of the foot. The area of forgiveness is the smallest of all the surfaces. The ‘Structure’ competition was close but ‘Bottom’ pulled out a narrow victory. The other disciplines evaluated in this competition were: receiving, dribbling, passing, shooting, popularity among professionals, and ease of learning. In the first annual Soccer MVP (most valuable part) Tournament, I am pleased to announce that the winner is … (drum roll please) … the INSIDE-OF-THE-FOOT (cheers and confetti please). The contest was not even close. ‘Inside’ won in a landslide. The head, chest, and thighs failed to make the finals. Many argued that ‘Head’, and more specifically the brain, should remain in the tournament because of its overall important function. However, when analyzing the head from a purely soccer standpoint, it along with ‘Chest’ and ‘Thighs’ were determined to play only a limited role in soccer. The same fate befell ‘Toe’ and ‘Heel’. While those parts of the foot are used on occasion, they are not used enough to be considered a potential MVP. 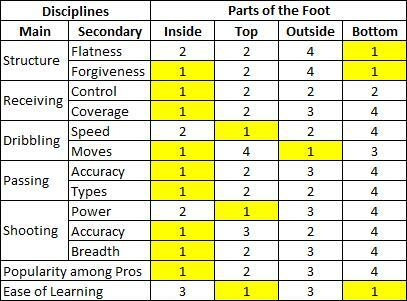 Of these disciplines, ‘Inside’ was the clear winner with nine 1st-place finishes (see yellow cells in the table below). ‘Laces’ was declared the runner with its two 1st-place finishes even though ‘Bottom’ finished with three 1st-place finishes. In fact, ‘Bottom’ was relegated to last place because of its tournament-leading eight last-place finishes. Follow-up posts will go into more detail in terms of how each discipline was played out. But based on the results, there are two points I would like to make now. ‘Inside’ won all but two of the disciplines. Yet in many youth practices that I have observed and the many training DVDs I have watched, not enough emphasis is placed on this part of the foot. If soccer is to improve in the United States, our young players need to learn the importance of and be taught how to properly use the inside-of-the-foot. Unless a player is abnormally bow-legged, learning to use the inside-of-the-foot is not easy or natural. It takes a tremendous amount of time, effort, and energy for a player just to feel comfortable using this part of the foot. The longer a youth player goes without learning how to use the inside-of-the-foot, the less likely he/she will be able to reach his/her full soccer-playing potential. Loopball is a great way to introduce and teach the importance of the inside-of-the-foot. This will be the first of what I hope will be many MVP tournaments. In order to make next year’s event even better, I welcome all comments and feedback. Author’s note: What do you call this part of the foot? Please vote. As a youth soccer coach, my biggest surprise and a source of continuous frustration was the poor ball control (and poor first-touch) exhibited not just by my players but by nearly all players who I saw play. I remember thinking that this must just be a youth problem. As these player got older, they would certainly develop this skill, right? Much to my surprise, this was not the case. I found that a majority of high school varsity soccer players did not possess this critical and basic fundamental skill. Loopball is FUN to use! Visit the Loopball website to learn more about it. Players need to learn and understand the importance of ball control and the incredible power of the inside-of-the-foot. Coaches and parents need to emphasize and reinforce the importance of ball control. Proper form, mechanics, and technique need to be used and taught to control the ball with the inside-of-the-foot. The Loopball training device and the companion Loopball curriculum will do this. Stay tuned for many, many more posts on the subjects of Loopball, ball control, the first-touch, and inside-of-the-foot. Enjoy Loopball!